^ Warren-Findley, Jannelle (1998). 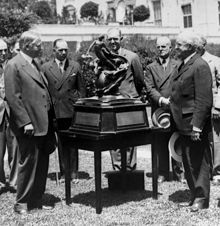 "The Collier as Commemoration: The Project Mercury Astronauts and the Collier Trophy". In Mack, Pamela E. From Engineering Science to Big Science: The NACA and NASA Collier Trophy Research Project Winners. The NASA History Series. Washington, D.C.: NASA History Office, Office of Policy and Plans. p. 165. ISBN 0-16-049640-3. LCCN 97027899. OCLC 37451762. NASA SP-4219. Retrieved March 26, 2018.